Everyone’s crossing over these days…In cars, that is, as the ‘crossover SUV’ continues to barge ahead in popularity. One of the latest is the Vauxhall Grandland X. This model is the second to come out of Vauxhall’s takeover by Peugeot and based on their 3008. As the cars are front-wheel-drive only, we wonder what the ‘X’ signifies. Our test car was a Grandland Sport Nav version, with a 120 PS, 1.6 diesel engine and 6-speed manual gearbox. Sport Nav is towards the top of the range and has an impressively-long list of standard features. Starting with OnStar, Vauxhall’s handy personal secretary system. You can, for example, get to ask someone to enter stuff into your satnav as you drive along; it also features automatic crash response, stolen car assistance, and other clever connectivities. Apart from these, there’s further connectivity as is now usually available in today’s cars. All fairly clear and easy to operate, the system also includes Apple Carplay or Android Auto. Quite an attractive interior is enhanced by the panoramic sunroof (a £695 option) so, even in the rear, there’s a pleasant ambience and feeling of spaciousness. In fact, three adults could just about fit in the back, in that the floor is flat, so no shoes fighting for space. Even though there is no fore and aft seat movement, getting in and out is no great problem. The two outer seats were provided with heating if required; there is also a USB port. 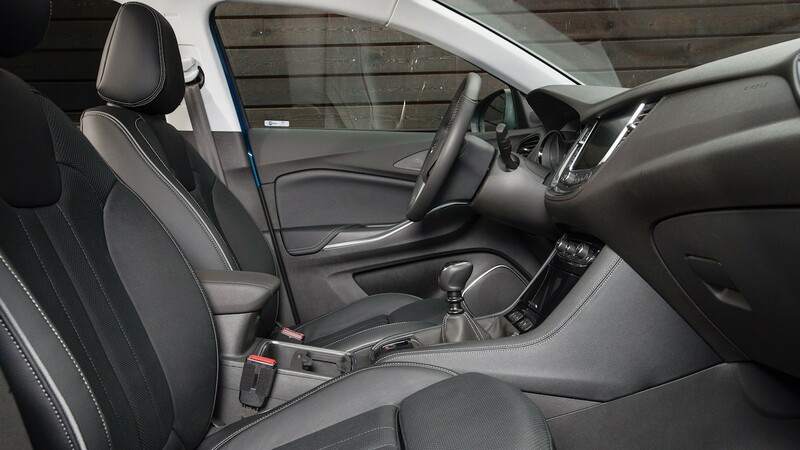 Up front, the Grandland X offers plenty of room and seat adjustment. Most drivers, unless exceptionally tall or short, will be able to find the ideal driving position and the seat itself I found to be perfectly comfortable, and with heating available: in fact, so strong was the heat that I could turn it down or off very quickly. The fit and finish and quality of materials, such as soft plastics, seemed fine, but the storage spaces could perhaps have been a little more generous. The boot is plenty big enough (there was a £110 option spare wheel under the floor) and the tailgate closes via a push button. The tailgate is quite high up and maybe a problem for shorter people, but the other way to operate it is by having the key in your pocket and waving a foot underneath the bumper. Nevertheless, I was unable to get this to operate, even though I had it successfully demonstrated! Driving the car was enjoyable enough, with a willing and reasonably refined diesel engine mated with a pleasant six-speed gearbox. The ride was comfortable and lengthy journeys were no stress. Some wind noise was evident, not much but discernible above engine and road noise, once the car was going around 60 mph, but very windy conditions most of the week in the car may have been the cause. It was usually wet, too, and I found that the automatic wipers had different ideas from my own, so I was continually having to make adjustments. Generally, though, there were no other little niggles. The standard Safety Pack included a Driver Drowsiness System (not experienced, I’m pleased to report), Forward collision alert and emergency braking (ditto! ), Lane assist (experienced via a gentle nudge) and Side blind spot alert that was often in action. All these do give a sense of security. For manouevering, the option of Park Assist front and rear at £570 is worthwhile. So, too, the Premium LED forward lighting pack, for which £1100 is not cheap, but they pay dividends on stormy nights. Basic stats for this model are a 0-62 mph time of 11.8 seconds, top speed 117 mph, 300 Nm of torque at 1750 rpm and emissions at 104 g/km. As to fuel consumption, taking the official combined consumption figure of 70.6 mpg, the consumption indicated on the trip computer, which rather strangely never deviated except from 46.2 mpg to 47.0 mpg and back again, seems a touch disappointing. However, given the full mix of traffic conditions and bad weather meaning lights, wipers, heating, demisting and so on were all in the fray, those figures (giving a range of around 530 miles) are quite acceptable. It’s a tough SUV market and Vauxhall’s Grandland X, looks reasonable at £25,950 before options, it is setting out quite a strong stall.